A circle is a simple closed shape. It is the set of all points in a plane that are at a given distance from a given point, the Centre. We can also define it as the curve traced out by a point that moves so that its distance from a given point is constant. These video lectures have been prepared exclusively for all English medium state board and central board class 10th students to have the understanding on surface areas and volumes. 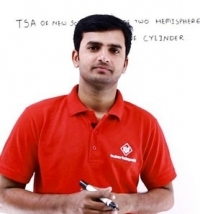 He holds a B.Tech in Mechanical Engineering from IIIT, Basar Currently associated with Tutorials Point as a Mathematics and Physics Trainer, He delivers lectures for classes 11,12, and IIT JEE students. Apart from subjects, He has good experience as Subject Matter Expert. In addition, He has worked on various projects such as NLP(Natural language processing) and Supersonic airfoil design.